I couldn't resist taking photos of this kitty while she was waking up from her nap. 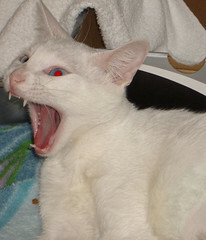 Vampire kitty can has bloooooood? The top picture shows a red retina in the left eye. Is that a lighting/photographic artifact, or the real anatomy? If the latter, I'd never known before that albinism in cats can extend to the eye's retinal screening pigments. It's a lighting artifact. She has blue eyes. Here is a photo taken without flash. She did not seem to be deaf. I tapped on the wall out of her line of sight, and she reacted. Point 2 - You didn't insert the no-flash picture, or provide a link. As for the red coloration, it's a flash artifact. Cats with blue eyes seem to have red glow-eyes, cats with other color eyes seem to have other color glow-eyes, such as yellow. 1. My cats frequently have "red" eyes if they look at me while I take pictures: http://cats.mjlayman.com/catchair.jpg They all have green eyes, although Spirit (up front) is going blind. Her mom was a Siamese and it's a genetic disease. 2. She makes links lavender and I've gotten to where I guess right most of the time. In that post, it was the word "Here." The cat in the photos is up for adoption at Peninsula Humane Society. Her name is Ivory. 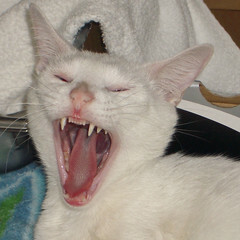 For the second: "Diva cat haz 4-octave range"
She needs to go in the Spontaneous Opera Syndrome Flickr pool. Feel free to add the photo there, I can't quite figure out how it works.